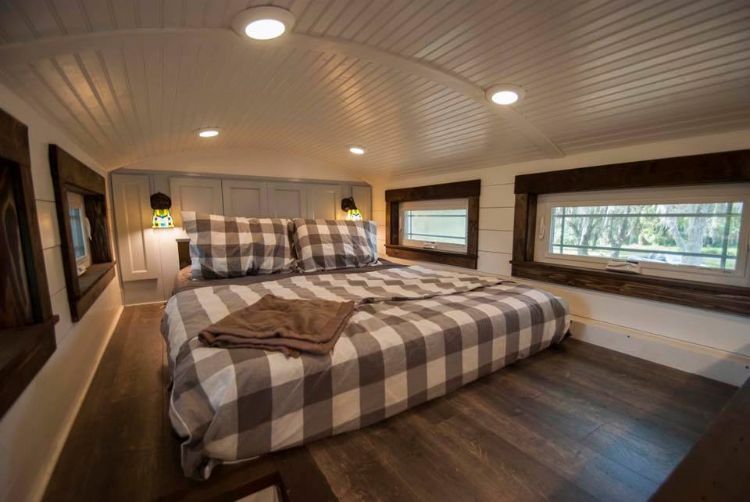 Tiny home living and luxury might not seem like words that would normally work together. After all, many homeowners are looking to buy bigger when they want more luxurious accommodations. 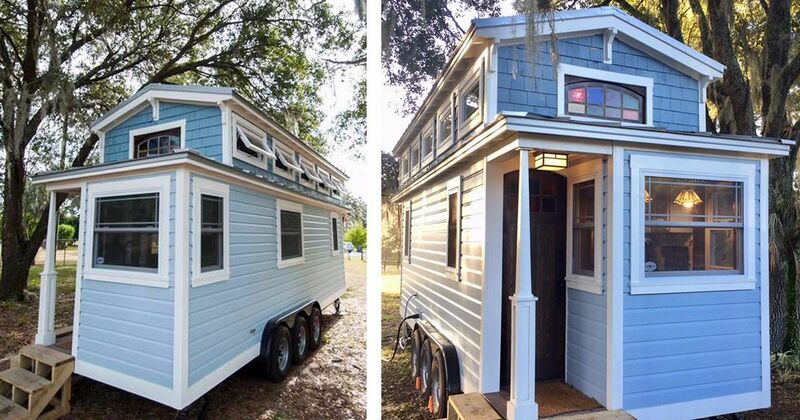 However, A New Beginning Tiny Homes shows that it's really quite easy to fit plenty of beauty into a tiny space. Adam Lehman, a remodeling contractor with more than 15 years of experience, built the award-winning home featured below. The home was nicknamed "Tiffany" and sold to a buyer who will park her on some property in Florida. With high ceilings and plenty of windows, this home will fit right in with the sunny weather and sandy beaches. The dark hardwood floors in this room tie in with other touches of the same material throughout the inside. These touches (from the window frames to the stair railings) help this space feel more expensive than it really is! High windows maximize light without giving up privacy. 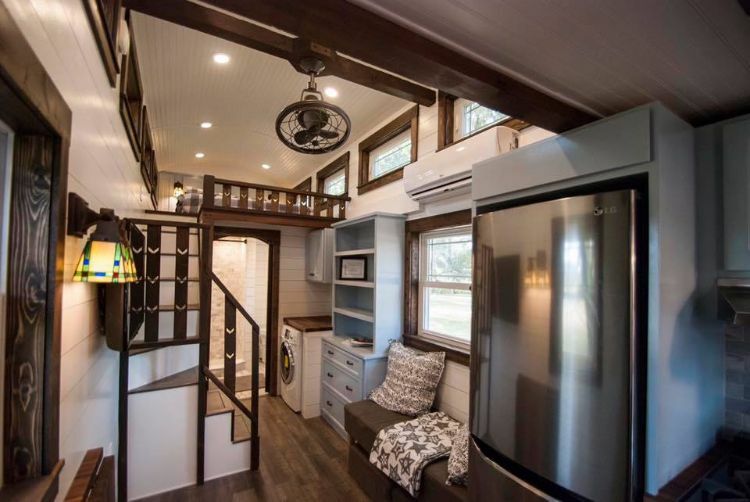 The spacious floor plan includes a small sitting area and a room for a built-in table. The ottomans can double as extra seating if any visitors stop by! 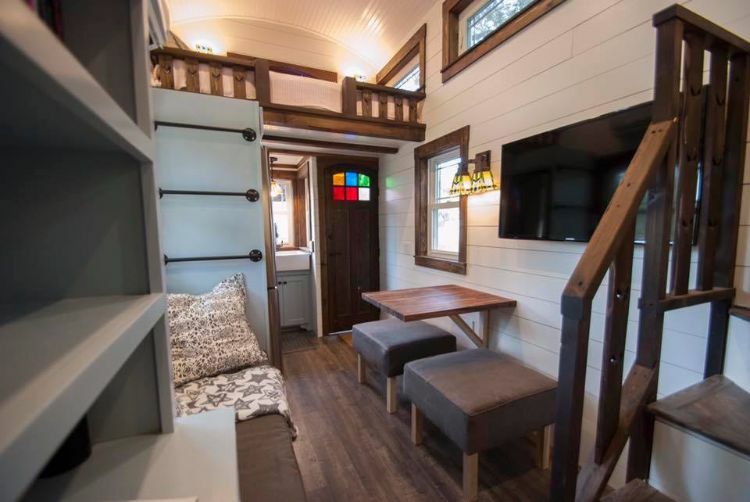 The master loft looks absolutely massive, especially considering that it's in a tiny home. The high ceiling creates a comfortable feeling with plenty of breathing room. Recessed lighting and long windows make it impossible for this space to feel dark. 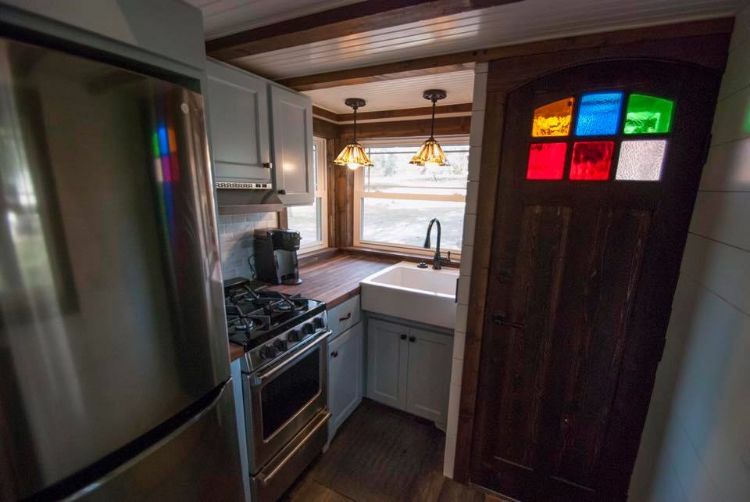 The nook of a kitchen might look small, but there's a full-sized sink, stove and fridge with a little prep space and storage space too. And you can't help but admire that beautiful stained glass door. 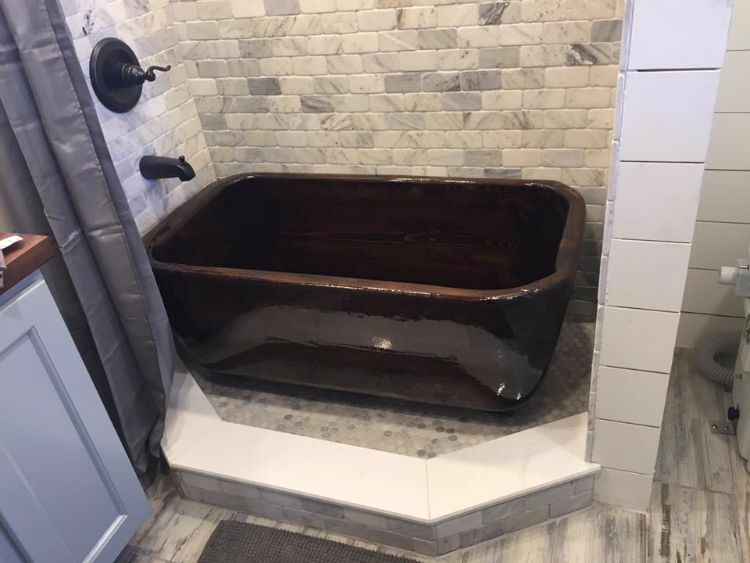 The beautiful tub basin can be easily moved in and out of the shower space to accommodate the homeowner's needs. Need even more storage space? 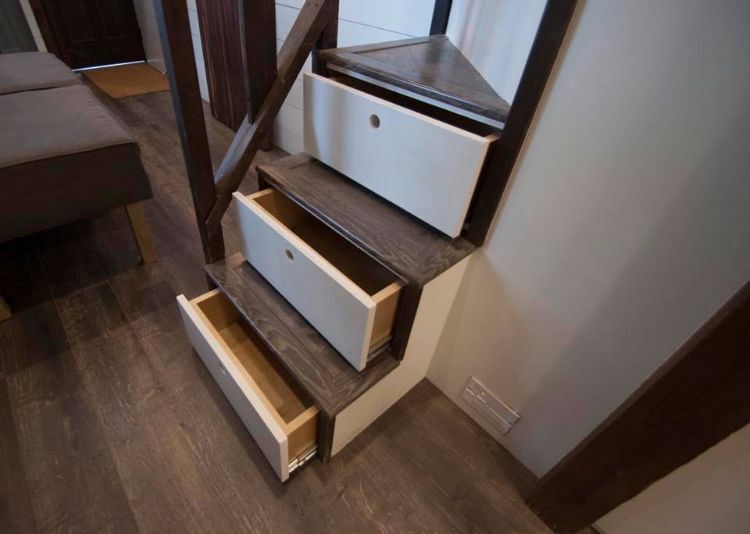 This clever design features in-stair storage for shoes and other goodies so the floor space stays uncluttered! Adam told Smaller Living that one shouldn't sacrifice on your home finishes. 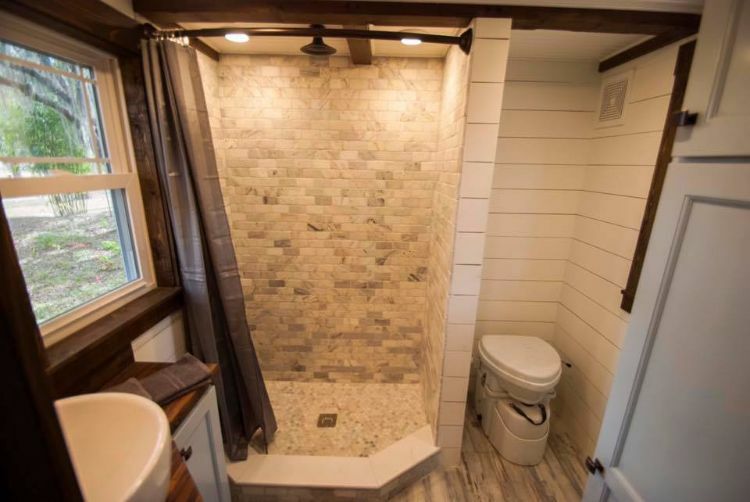 He said, "It's okay to have a beautiful shower and a functional kitchen. Yes, those things may cost a bit more in the long run. But this will be your home for many, many years to come! Especially if it is built well. This house is a home that you can give your children." What do you think of this home? Make sure to share it with all of your friends on Facebook.